Pavakkai – Bittergoud or Bitter Melon is among the most bitter of all vegetables. 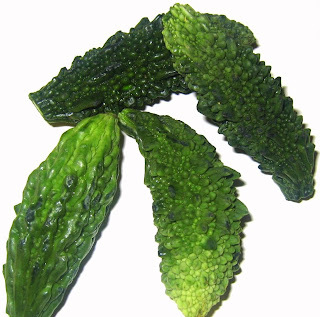 It is also a popular vegetable in Indian Cooking. Bitter melons are rarely mixed with other vegetables due to the strong bitter taste. Rich in iron, bitter melon has twice the beta-carotene of broccoli, twice the calcium of spinach, twice the potassium of bananas, and contains vitamins C and B 1 to 3, phosphorus and good dietary fiber. It is believed to be good for the liver and has been proven by western scientists to contain insulin, act as an anti-tumor agent, and inhibit HIV-1 infection. In spite of all the benefits it has to our health, I am the last one to like the taste. I cannot have anything bitter. I have many stories about how I avoid eating Ppavakkai. Appa was one big villain when it comes to me eating Pavakkai. I would crush them under my plate or hide them in my dress to throw them away. Amma made Pavakkai very often. She never attempted to reduce the bitterness. Pavakkai is available in Indian stores in Seattle, finding them fresh is very rare. This week I was lucky enough to find tender fresh Pavakkai. I know very few people like Pavakkai but I recommend everyone to try it out. I am the first one to hate Pavakkai but like this urugai. This is Amma`s Pavakkai urugai recipe. My version is frying the Pavakkai to remove the bitterness, which Amma never did. 3 cups finely sliced Pavakkai/Bittergoud. 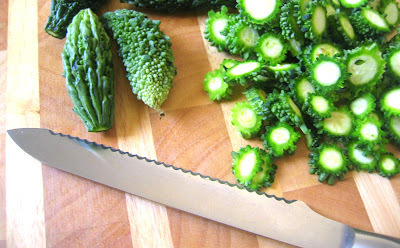 Cut the Pavakkai/Bittergoud finely as shown. Extract the juice from tamarind and set aside. Heat oil in a Kadai/Pan and deep fry the Pavakkai/Bittergoud for about 5 to 7 minutes (Do not fry them to brown). Heat about 4 tablespoon of oil, add the mustard and fenugreek. When the mustard splutters, add the tamarind juice, chilli powder and salt. Mix well. Boil this mixture and simmer for about 10 minutes or until oil separates. Now add the fried Pavakkai/Bittergoud and asafoetida . Mix well so that everything gets combined. Looks really good. I will def try this out. I ve to try this BG pickle looks delicious! 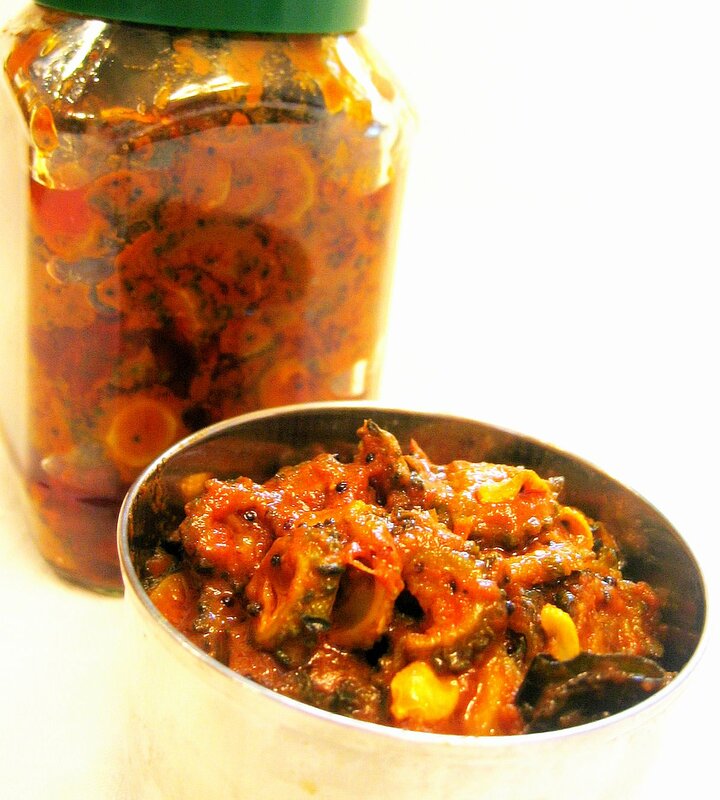 OOO... pickle is my fav side dish.ur recipe sounds good. Thank You all, I am sure you will like the pickle. Try and let me know. 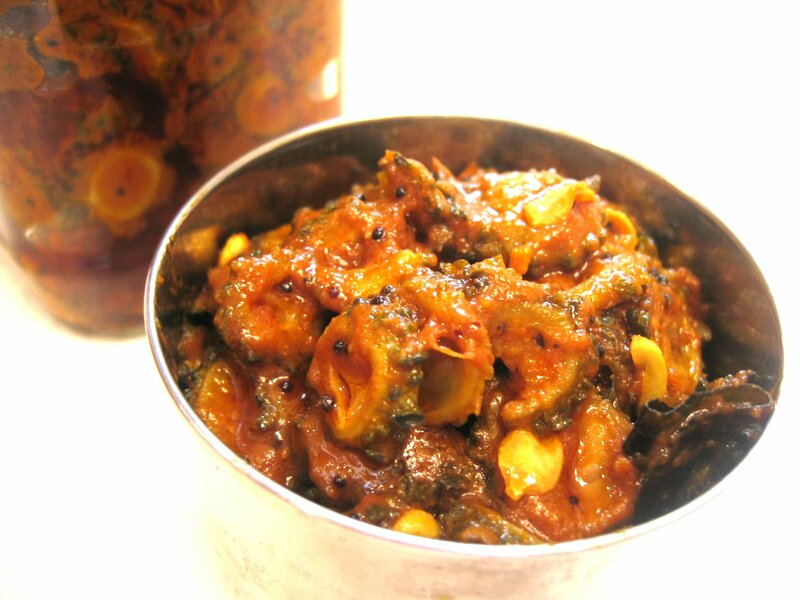 Ranji, you have a nice blog and your pickle looks delicious. I will try your recipe next time I make it.